Home > Latest News > News > What is the Dirt and Gravel Road Program? 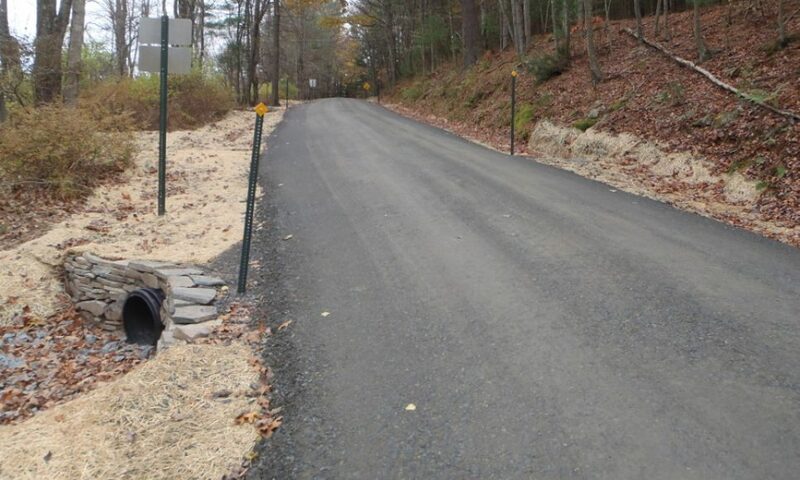 Pennsylvania’s Dirt Gravel, and Low Volume (DG&LV) Road Maintenance Program provides funding to eliminate stream pollution caused by runoff and sediment from unpaved and low volume public roads. The program promotes Environmentally Sensitive Road Maintenance (ESM) Practices, which reduce road runoff and sediment to local streams while reducing long-term road maintenance costs. The Pike County Conservation District works with municipalities within the county to provide technical assistance and funding for improvements to DG&LV roads. Funding for the program is allocated through a cooperative agreement between the Pike County Conservation District and the Pennsylvania State Conservation Commission. The District administers the program locally working with municipal officials to identify potential projects. Additional technical assistance is provided by Pennsylvania’s Center for Dirt and Gravel Roads, PA Fish and Boat Commission, and USDA Natural Resource Conservation Service. In the past nineteen years, forty-seven projects in eight Pike County municipalities have been funded. In that time the District has provided a total of $1,115,000 in Dirt & Gravel Road funding. In 2015, a newly funded program for Low Volume paved roads was added. To date two projects have been funded through this program with a total investment of $54,000. These funds supplement local road maintenance dollars. Local road-owning entities are encouraged to apply for this funding. Local road-owning entities include municipalities, PA Game Commission, PA Fish and Boat Commission, PA Department of Conservation and Natural Resources, PennDOT and other local government agencies. Applications for funding through this program are due on April 14, 2017. For more information about the grant program contact Michele Long at the Pike County Conservation District at 570-226-8220, email mlong@pikepa.org or visit www.dirtandgravel.psu.edu/pa-program-resources/conservation-districts/pike-county.